The days have been cold here in the mountains lately, the sort that begin with frost on the ground and end with a warm fire and a hot mug of herbal tea. This morning it was especially cold, so cold I found it hard to get out of bed … no matter how hard I tried. I’ve learned on days like this, however, that within the cold there’s always a little warmth hiding somewhere. It’s that way with everything. You just have to look beyond the obvious. This morning I found a warm place in the tender squeeze of my wife’s hand and the soft texture of the thick blue blanket that envelops our bed. As I lay there mindful of the warmth, grateful for my wife and for the blanket, my mind wandered. I recalled the day I bought that blanket. While waiting in the long line of cars to cross the border from Tijuana, Mexico back to the United States, I’d looked out the window and spotted a woman standing in the hot sun under several heavy blankets. She had a smile on her face but her body betrayed the weariness of a hard life. Her back was hunched under the weight of the blankets. Her skin was parched and cracked the way skin does when you spend your days, every day, all day, standing in the hot sun hoping for a little generosity from passing cars. 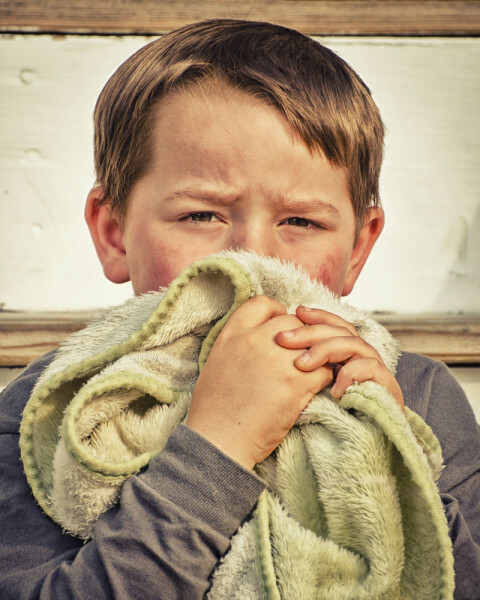 I noticed that behind her, hiding in the blankets, was a little boy — her son I assumed. He had one hand safely gripping his mom’s shirt; in the other hand he held a worn out stuffed animal, a superhero of some kind wearing a mask and a tattered red cape. I recognized the look in the boy’s eyes … a combination of the desire to get away from the lines of traffic and play with his mom and the cold reality that this was how life was. I’d felt that feeling many times, sitting with my mom at her work wishing we could leave, though knowing that she had many more hours of work to make ends meet. I wondered what dreams raced through his mind as he hid in those blankets looking out at the world. I wondered if he thought we had it made, comfortably shaded from the sun, driving shiny new cars, waiting in line to go to our big houses filled with all the stuff that comprises the American dream. The truth was, on that day, a part of me wished that I was him. Only a year removed from the death of my mom, the daydreams of being able to hold her hand — even one more time — were still strong. And as I watched that little boy from the safety of my car and my cozy life, I thought that I’d trade it all to be a boy again holding my mommy’s hand as we navigated life together. So I bought a blanket that day; in fact I bought them all, and I gave her a $50 tip. It’s the kind of thing you do when you’re trying to make a point, wanting to be good, to honor something more than a commercial transaction. Buying those blankets was my way of saying I love you to my mom, of honoring the hard life of that boy and his mom, and showing gratitude for the moment that had touched my heart. A tender kiss on my cheek and my wife’s cold lips brought me back to the present reality of our warm bed and the chilly air that awaited me when I worked up the courage to get up. I lay there for a moment more … savoring the soft blanket, grateful for my wife, for our love and a life that has, after so many twists and turns, brought me here. I’m having an interesting experience this holiday season. Let me say it more clearly, I’m not really in the “spirit.” I’m not entirely sure why. The carols and lights and cheery faces are all the same. It just feels a little forced this year. Maybe, given all that’s going on in the world, it’s all a bit artificial and out of place. Does that make sense? Like the gooey jewelry store commercials where the perfect couple gives each other the perfect diamond gifts before giving each other the perfect kiss in front of the perfect Christmas tree just seem oddly positioned in a commercial break wedged in between stories of war, oppression, and global warming; and the cheery slogans and 50% Off signs painted on the windows of the small downtown strip in the city where I live look foreign next to the dozen or so homeless men, women, and children holding signs asking for spare change to hobble together a meal; and the Christmas cards featuring people I don’t really know that well and their kids wearing campy red and green sweaters with reindeer brioches and Santa hats doesn’t jibe with the all the people I know who are suffering, weathering the storm of divorce, addiction, pain, and loneliness this time of year. It’s not that I’m depressed. I’m not. In fact I’ve never been happier. It’s just that I don’t want to be numbed. You know? There’s a lot of happiness that’s real and genuine and actually experienced in the heart and then there’s this thing going on designed to make us look away from the realities of our world and max out our credit cards with the belief that if we do life will suddenly turn into the scene from that jewelry store commercial. But it doesn’t. Because life’s not perfect nor scripted nor directed by a Madison Avenue agency. It’s just life. Maybe the explanation is that life shows up for us all a little differently. Within one frame of our life we can see a homeless teen begging for a meal and a busboy clearing a table full of uneaten food at a restaurant; or tourists with wallets full of money returning to the land of opportunity as they drive by women and children whose holiday is changed by selling a blanket; or families united in love walking hand-in-hand down the street while others — enduring divorce, abuse, and abandonment — walk alone down those very streets with no hand to hold. That’s life I think, and in order for a season to be authentically jolly we have to accept not just the carolers but also the people who have no voice with which to sing … and all the parts of our inner selves that are in conflict, too. I got a call recently from an old friend. It started with a crack of her voice and the words, “How do I begin?” Those words are, in my experience, often the very difficult first steps of growth, the bursting of our own bubble of illusion, an allowance of something authentic and real to flow through our lives. “I’ve been drinking … a lot,” my friend said. And then she cried. Through the tears, she managed to hobble together the words, “I got a DUI … I’m scared.” I took a deep breath and said the only thing that seemed to matter at that moment. “I love you. I’m here for you. It’s going to be okay.” And then my friend cried some more. I spoke to her the other day. She told me she’d been to a couple of Christmas parties since then and not had a drink. She was so proud of herself. I thought about what the holidays mean for her, for her husband, and for their children this year. How the greatest gift for them won’t be anything bought or wrapped but the very real reality that their mom is home, sober, present, and healing day by day. We don’t make commercials like that very often. Real life doesn’t help sell cars or rings or bottles of Jack. Maybe that’s what I’m not feeling this year … the commercialization of our humanity. And maybe that’s the gift we can all give each other — an invitation to be human; an opportunity to open our hearts; the acceptance of whatever pours out. A holiday of real-life human beings who show up without our costumes and masks and discover that we’re not all that different from one another and, most importantly, that we are actually loved just as we are. This week I invite you to snuggle up to real life. To forget about the lists, the gifts, and the picture-perfect cards and just be yourself. Whatever that means for you this year, right here and right now. Allow real-life to be okay. And then extend that gift to the people around you. The jolly ones, the grumpy ones, the ones who can’t seem to find a smile through the pain. Underneath we’re all the same, perfectly imperfect, doing what we can, making our way through life, searching for a warm blanket, a tender hand to hold, a little safety, and the sense that we are loved. We’re all searching for a warm blanket, a hand to hold, and the sense that we are loved. Thank you for your loving and thoughtful words. You. captured the season well we all have so much to be thankful for. May your holidays be full of love and warnth. Love and hugs Mrs C.
Thanks for sharing this, Jason. It touches a special chord with me because of what’s going on in my life right now. I’m a recent subscriber and am really enjoying your words. Enjoy the holidays and all the best for 2016. Thanks for helping me stay grounded and keep life in perspective. You are a poet. I love you, man. Thank you for sharing this, Jason. It’s beautiful… I just rediscovered myself, and am so thankful that I’m not alone. Bless you. I really relate. Having lost my mom a few years ago, I often wish I could see or talk with her one more time. What you did for the woman and her son was an act of kindness and generosity.